A prairie is a plant community dominated by native grasses such as big bluestem (Andropogon gerardii), indian grass (Sorghastrum nutans), and switchgrass (Panicum virgatum). But prairies also have abundant wildflowers such as purple prairie clover (Dalea purpurea), prairie phlox (Phlox pilosa), rough blazing star (Liatris aspera) and stiff sunflower (Helianthus rigidus). The term mesic refers to the normal moisture content of the prairie soil, which in this case is somewhere between wet and dry. Mesic prairies are considered fire-dependent communities, meaning that they depend on frequent fire for their continued existence. In the absence of frequent fire, mesic prairies are invaded by trees and shrubs, and in time will become forests. Mesic prairies were once the dominant vegetation type in southern and western Minnesota, but since the time of European settlement they have been largely replaced by agriculture. 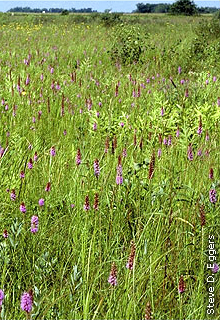 Mesic prairies can be very luxuriant habitats, with an almost garden-like profusion of flowering plants and grasses. Individual species may reach 6 feet in height, but they are usually mixed in among shorter plants so the overall effect is that of a layered environment with surprising visual appeal.